We're currently gearing up for our next adventure - the 2013 tour through Western Washington state! We'll share our blend of education, entertainment and service with many different communities, large and small, close to where many of us call home. Our 50+ member multi-generational troupe of volunteers will present community events that feature parades, workshops and vaudeville circus. 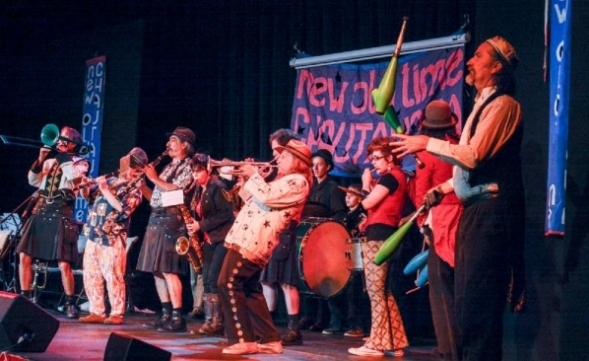 We also bring our lively members and shows to people in communities who cannot come to see us – typically those in hospitals, care centers, and correctional facilities. our website and Facebook page! We'll be updating our TOUR BLOG once we hit the road. Most of these shows are preceded by parade, free workshops, teaser shows and other events, so please check our website, Facebook page or the sponsoring organizations' site for more details! We hope you can join us, and please spread the word to all your friends in Washington! This spring brought Chautauquans from near and far together to perform on Vashon Island at Open Space for Arts & Community on May 19th. We livened up their huge space with The Fighting Instruments of Karma Marching Chamber Band/Orchestra, The Flying Karamazov Brothers, Joey Pipia, Godfrey Daniels, Christian Swenson, Scuff & Boom Boom, Justin Credible, Yipee & Kiyay, and local acts Duo Finelli, David Godsey, Janet McAlpin and The Rev! Check out more photos of the event! This weekend, July 20-21, those stalwart vaudeville heroes the Flying Karamazov Brothers will be trekking to Corvallis, Oregon right before the start of our tour to perform at the daVinci Days festival to support Chautauqua's work. Many thanks to their generous spirits. SIX - count 'em - Flying Karamazov Brothers did up some Jazz at the Vashon Island show. 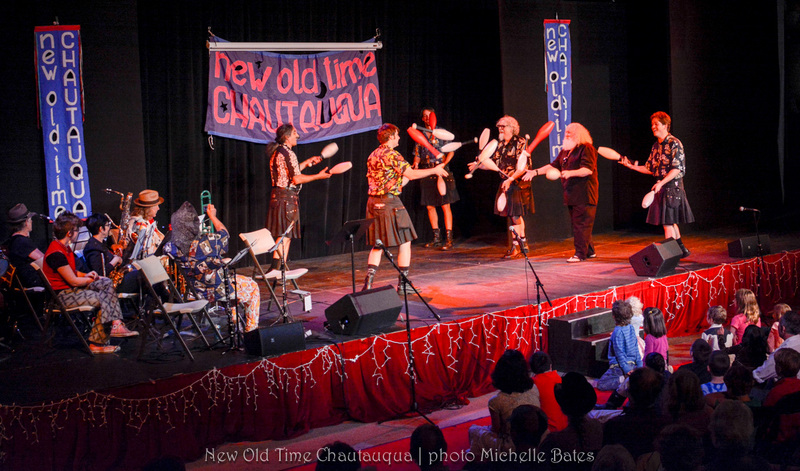 Thank you to donors who have already helped support New Old Time Chautauqua and this year's tour!